In the South-West of Europe 92090 km² of land stretch out in front of the Atlantic: welcome to Portugal! If you haven't discovered this country yet, you are sure to be taken aback by its diversity and rich heritage. Attached to its folklore, Portugal has always known how to poetically mix tradition and modernity. Set off on a trip through a colourful country painted by varying landscapes, its ancient facades and its generous platters. In the small blue and white cobblestone streets, a Portugal specific trait, discover the warm atmosphere all over thanks to the mild weather and the locals' natural friendliness. With a large choice of vehicles, hiring a motorhome in Portugal has never been easier than with Yescapa. Choose your campervan or converted van, the dates of your trip and set off to discover the wonders of Portugal. Start your tour of Portugal with a trip through time. 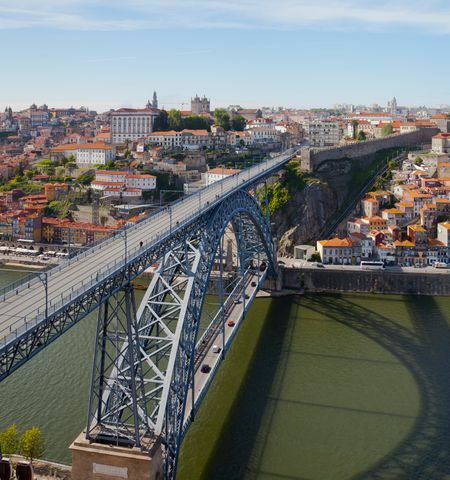 Porto, the country's second city, is a colourful city often landmarked by the Dom Luis bridge. As a symbol which connects the two riverbanks, it must be crossed on foot in order to see Porto from its most beautiful angle. The historic city centre of the city is miniture compared to the rest, making it easy to visit the main monuments on foot. For fans of the Harry Potter saga, a stop at the Lello bookshop is a must: both the bookshop and the town provided clear inspiration for the saga. The spirit of Porto can be felt in its steep narrow streets, in the scents from its flowers and in its local gastronomy. Below the city, the Ribeira district is the most typical. Very lively by day and night, here you can fully appreciate the typical houses bordering the river, the sunny terraces and the lively discussions. Take the route by motorhome to one of the oldest vineyards in Europe. Green in summer and the colour of fire in autumn, the Douro Valley is breathtaking. In order to fully appreciate the beauty of the landscapes in this wild and mountainous region, there are two options available to you: a ride on the train or the river cruise. The trains date back to the era when the wine produced in Porto was sold this way. Today, they are used as transport for the curious that have come to visit the caves for a wine tasting. You will travel along hillsides with a stunning view over the river and the vineyards. The cruise allows you to see the region from a different angle that is much less often seen. On board the boat, breakfast and lunch are on the programme as well Porto wine tastings, and you can also try the local specialties. 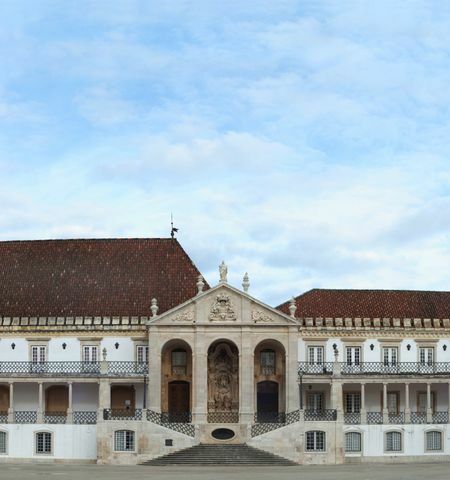 The small town of Coimbra is the theatre of a fascinating duplicity: it's a town with an extremely rich historical heritage made up of churches, monasteries and convents. This city on the top of a hill houses one of the oldest universities in the world, where students from all over Portugal and Europe come to study. Here in this town where each aspect is a remnant of Portugal's golden past, young students bring a lively atmosphere both by day and night. The best time to visit Coimbra is without a doubt in the month of May for “a Queima das Fitas”, literally meaning "Ribbon Burning". It's a graduation party for the Portuguese students. This party, a mix between the spirit of sharing and old traditions, is particularly impressive in Coimbra. Cross the river Mondego by motorhome to find yourself in a mini Portugal. We're talking about an educational theme park aiming to promote the cultural and architectural heritage of Portugal. Far removed from the typical miniature reproductions, this park is scaled to the size of a seven-year-old. Older kids should head in the direction of buildings like the traditional Portuguese windmills. Not far away, you can find the Conímbriga ruins, one of the richest archeological sites in the country. The site is made up of a collection of buildings including thermal baths, an aquaduct and a christian basilica. The mosaics which cover the floors of the ancient noble houses will not fail to amaze you. Life in Nazaré is closely linked to fishing. Commercial activity in the area doesn't stop the locals promoting their seine fishing tradition, on board boats in the same colours as the skirts with 7 petticoats worn by the fish traders. These colours can be found in the paintings on small cabins found all along Nazaré's main beach. The rest of the town is painted in bright white, contrasted with many flowers on windowsills and with the blue from the tiles on the façades. Nazaré is famous for its headland nicknamed “o Sitio”, which you can get to by cable car, by tourist train or by foot for the most courageous. The high part of the city retains its former charm that is very much valued by locals and visitors. But if you climb the “o Sitio”, it's above all for the view. This 318 metre high steep rocky mountain offers a magnificent view over Nazaré on one side and a breathtaking panorama over the North beach on the other, very popular with experienced surfers. Take to the road in camping car to the wildest beaches: it's time to dive in! 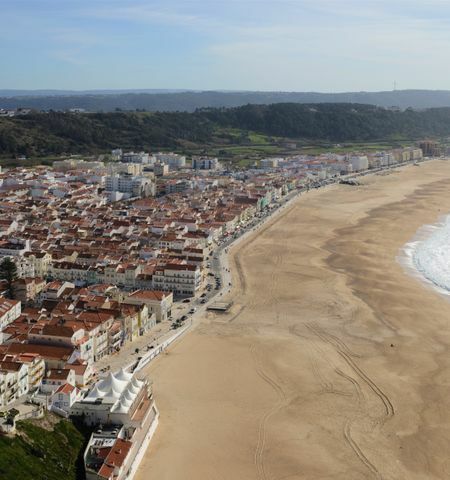 With more than 1,100 miles of coastline, Portugal offers a large choice of beaches, but the beaches to the south of Nazaré are perfectly suited to gliding sport enthusiasts, especially the beaches of Ericeira or Peniche towns. In Peniche you will find the Medão Grande beach, known for its “Supertubos”. And if you prefer calmer beaches, head in the direction of the bays of Consolação and Baleal. To continue enjoying the beauties of the sea, set off in the direction of the Berlengas archipelago, a natural reserve with crystal waters. Let yourself be swept away by the magic of Lisbon. The pastel façades and old bright yellow tram lines colour the lively streets of the Portuguese capital. We advise you take a walking tour so you can discover the surprises that hide around every corner. Various lookout points are scattered around everywhere and offer you great viewpoints over the city. 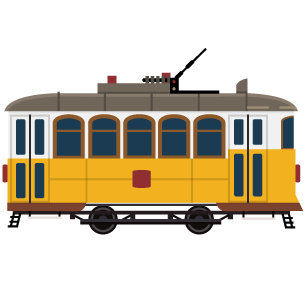 Lisbon is made up of a lower area, named “a baixa” and a higher area, known for the São Jorge castle and the Barrio Alto, an iconic area that is very lively at night. One of the oldest aeas of the city is the Alfama. It resembles an ancient village with its ancient houses and exchanges between the locals. Here, there are many 'fados' bars, an unmissable right of passage if you want to have a 100&#37; authentic experience. 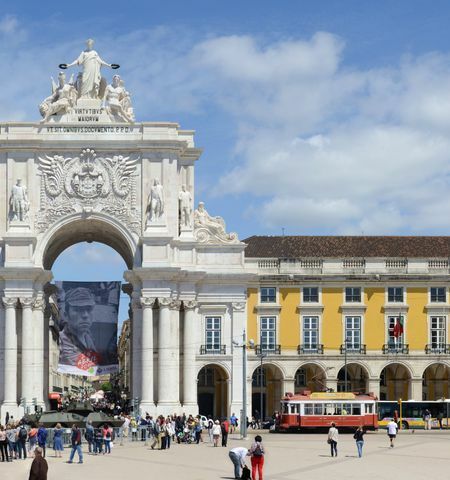 Take to the road by motorhome for two towns not far from Lisbon, world known for their historical and gastronomical heritage. First, climb up to Belem, the town of the “pasteis”, a small flan covered with a puff pastry made with a secret recipe. After a gourmet break in the magnificent traditional bakery “pasteis de Belém”, walk in the footsteps of the Portuguese sailors by visiting the discovery monument and the tower of Belem. At the foot of the monument of discovery, you will find a huge world map enclosed in a wind rose engraved in the floor. On the Sintra side, you must try the “queijadas”. These little melting tartlets date back to the 13th century and they're as secret as their versions from Belem. For a visit, Sintra is a ferry stop where the many castles are hidden in a dense forest where you can take refuge for some fresh air in summer. Classed as a UNESCO world heritage site, the capital of the Alentejo region is a city rich in historic heritage. Among the most essential sights that must be seen are the Cathedral of Évora, the Castle of Évora, the Roman Temple and the Church of São Francisco. The latter is home to a very unique chapel, called the chapel of bones, as the walls are covered with human skulls and bones. The idea of this chapel is to transmit the idea that life is short-lived and temporary. 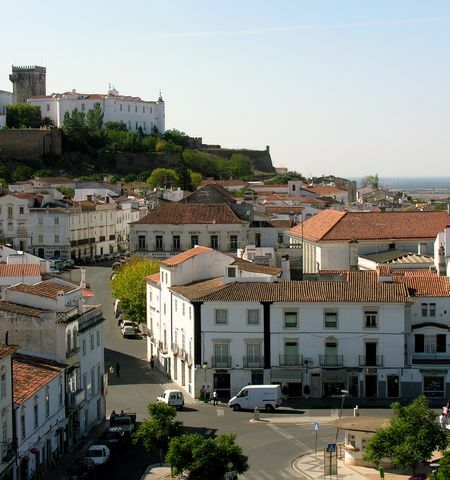 At the heart of Évora, you can find the Praça do Giraldo, the central square which joins 8 of the city's streets. Each of these streets is represented by a tap attached to the marble fountain opposite the Santo Antão church. Travel around Alentejo by motorhome, a rural region where the land has long decided the way of life of its inhabitants. In the back regions of this country, large plains made up of wheat fields waving in the wind turn into long stretches of red earth scattered with olive trees as you advance Southbound. The coastline of this region has a strong charm of its own, made up of often deserted long wild beaches that are not very well known to tourists. To continue your journey through time, discover the architecture and the relics of the past found in the towns of Elvas, Santarém, Portalegre and Beja. Very lively in summer, the old fishing port of the Faro district is a very popular destination today. First off, for its surrounding beaches like the “da Falésia" beach, a calm half-crescent shaped natural bay or the beach of São Rafael, with its yellow-earth coloured rocks that contrast the turquoise blue of the ocean. Away from these many beaches, Albufeira allows you to get a real feel for the area without being swamped by people. It's a very popular destination in Portugal thanks to its atmosphere. The many different bars, concerts and events encourage visitors to meet up in a very festive atmosphere. In the historic centre, the original traces of the country can be found in the white façdes, the narrow streets and the charm of the architecture. Take to the road by motorhome along the Southern Atlantic side of Portugal. 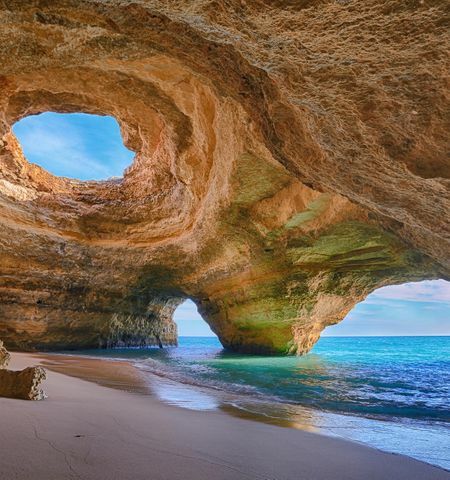 The Algarve is a popular destination for its moderate temperatures all year round. Despite its popularity with tourists, it is easy enough to find calm, isolated beaches, even in the middle of summer. But careful, certain beaches are only accessible by steep pathways or by sea. But the exploration is worth the detour, the more difficult a beach is to access, the more beautiful it is. For fans of golf, you can find two famous greens in this area. For a fun day with the family, go to the water parks like Slide and Splash or Aquashow Park.